That is cool, Doug! Got to see some details of some stuff I've only seen from a distance. So what is up with the town name? That is Three Lynx, but they called it Oak Grove? I don't know why he referred to the town as Oak Grove. Every map I've seen has it labeled Three Lynx. Other than that, though, it's a pretty good video. On a related note, I came across a reference to the Big Bottom Dam project in a book on the history of PGE. This was to have been a component of the Oak Grove hydroelectric project. A couple of years ago it was discussed here in this forum and the question was raised as to why the dam was never completed. Although it ultimately may have been abandoned because of cheap power from the Columbia River dams, the immediate cause was the financial crisis faced by PGE during the Depression. Work was in progress on construction of the tunnel, having started in April 1931. It was terminated sometime in 1932 or 33. Quoting from Electrifying Eden by Craig Wollner, "The work on Big Bottom, which reached thirty-five hundred feet, was halted at the end of the first phase because of the company's financial crisis. The 1932 Annual Report somberly notified shareholders that management was rigidly curtailing expenditures on system betterments of all kinds..."
Does that mean that there is 3,500 feet of tunnel out there between Big Bottom and the Oak Grove Fork? Here's some information I dredged up from the internet. It's from a tax court case concerning PGE. 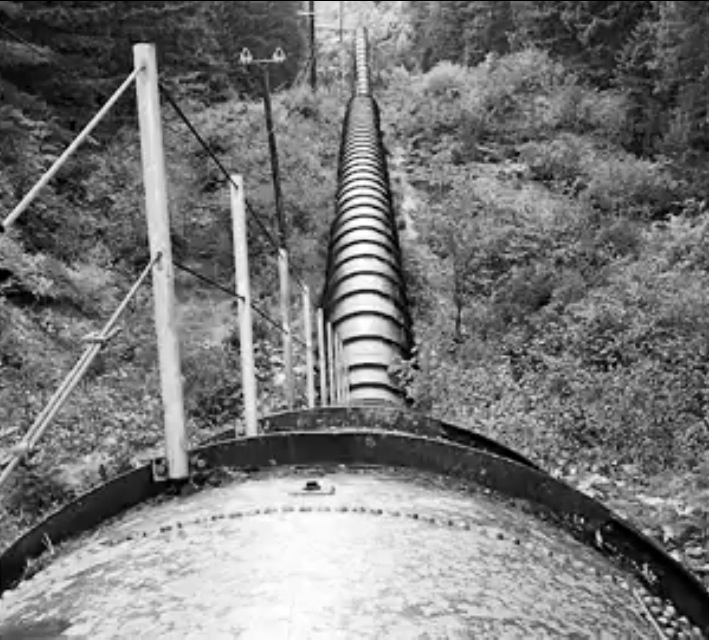 The pipeline from Harriet Lake to Station P was originally designed to carry 400 cubic feet of water per second, but experience showed that it could handle as much as 550 cubic feet per second. Inasmuch as Oak Grove Fork at times furnished only 300 cubic feet per second during the low water season, it was determined by petitioner's predecessor that it would be desirable to divert other waters to that pipeline so as to increase the flow through that line, with a resulting increase in the annual production of power at Station P. In this connection consideration was given to diverting water to Oak Grove Fork from the main branch of the Clackamas in an area known as Big Bottom, which was about four miles Southeast of Harriet Lake. The country surrounding this area is very isolated and rugged. Big Bottom itself is a relatively flat area about three-fourths of a mile wide and five to six miles long, located at the foot of the Cascade Range. At about the time that the initial unit at Station P was installed in 1924, petitioner's predecessor conceived a plan for the development of Big Bottom. The first step in the plan called for the digging of a tunnel through the ridge which separated the Main Branch and the Oak Grove Fork, which tunnel was to be about 20,000 feet in length. A relatively low-crib dam was then to be constructed at Big Bottom to divert the waters of the Main Branch through the tunnel to Oak Grove Fork, where the waters would be sent through the pipeline to operate Station P. The second step was to build a high-head dam, about 185 feet high, to create a reservoir for the storage of about 100,000 acre-feet of water; this reservoir, known as Big Bottom Reservoir, would have served to regulate the stream-flow and would have benefited all of petitioner's existing and proposed power plants on the Clackamas River. Consideration was also given to building an additional pipeline to take advantage of all of the water which would be stored. obtained from the State of Oregon (No. 8912) allowing the appropriation of waters at Big Bottom for the development of some 42,000 additional horsepower at Station P. This permit applied only to the diversion project. In 1929 petitioner's predecessor applied for a permit, Permit No. R-12571, to construct a reservoir and to store water in it from the Clackamas River. The reservoir permit was cancelled by the State in May 1931. The diversion permit is still in effect and petitioner continues to pay annual fees to the State with respect thereto. In 1931 a contract was entered into for the driving of 3,600 feet of the tunnel through the ridge in connection with the diversion project. This was done at a cost of some $400,000 and this portion of the tunnel was completed in 1932. Petitioner contracted for only 3,600 feet of tunnel because it desired to ascertain the construction problems it would encounter in the project. In 1932, the demand for electric power decreased greatly due to the depression and petitioner did not complete the tunnel. However, petitioner is still considering the possibility of completing the tunnel and the low-crib diversion dam and has not abandoned the diversion project. Petitioner and its predecessors made preliminary expenditures in the amount of $45,665.15 for exploratory work in connection with the Big Bottom Reservoir Project. Most of this sum was spent in 1923 and 1924 and the years prior thereto. The stream-flow readings and other tests made at the Big Bottom Reservoir site were of value for either the diversion or reservoir projects. The records of these surveys and tests have been retained by petitioner. The camp buildings erected at Big Bottom in connection with the survey work are still there. There are probably some plans, maps and photos of the tunnel project in this collection somewhere. So there definitely is a tunnel out there. I suppose the entrance was blocked off long ago. Thanks for the link to the court case, Kirk. The court decision provides a good summary of PGE's history on the Clackamas, at least through 1947. I didn't know about the proposed dam at Carver. That would sure have changed things out in that area. Interesting reading. There must be a pretty good pile of tailings out there somewhere. Once it's online, it's out of your hands. It's best to put as little online as possible if you are not prepared to see it pop up unexpectedly. What amazes me about the pipeline is ductile(?) iron, the riveting done on site, the endurance, the bedding/back filling (hydraulic) reliably lighting Portland homes for nearly a hundred years. I agree D2...some things are better left unsaid. Also heard mention of the hydraulic-mining removal of a ridge near Cripple Creek that was in the way. Remember that weird grade along Cripple Creek trail you showed me? Can you imagine Big Bottom underwater? What a loss that would have been. They took a mess of old Hemlocks on the ridges just above. Well Bob, I can imagine it underwater. Surrounded by second homes of affluent Portlantics. The road would stay open all year. And there would be espresso and micro breer. Big Bottoms IPA. But seriously, I have often wondered, if I had to build a city in the woods, where would I put it. Ripplebrook is a nice site. Not in a deep shadow. Already wired and plumbed. Phone and internet. And the power company keeps some semblance of order up there. But, living up there can be extremely dull. After a while one can't get down to the settlements too soon. Even just to Estacada. It needs about 50,000 residents to make it livable. Rumor has it that the tunnel can still be seen from the surface of Lake Harriet. Its not something the PGE folks talk about much or even remember any more. The PGE reps I am in contact with are very interested in that court case. I'm sure the company has a copy stored away somewhere but the current employees are not aware of it. Your link is now making the rounds there. Its a must-read for anyone interested in the history of the Clackamas Basin. I don't know why he referred to the town as Oak Grove. Every map I've seen has it labeled Three Lynx. I think the original name was Oak Grove, and it was near the Oak Grove Ranger Station. The only access to the area then was by going over Mt. Hood and down through the Timothy Meadows area. Over time the name Three Lynx became an alternate name for the area, especially after Ripplebrook replaced Oak Grove Ranger Station. Residential housing and campsites were spread around the old Oak Grove area and some have been removed and some remain; turn left just past Ripplebrook and you can see both along the road. What is PGEs claim on Cripple Creek speaking of history? I assumed it whatever it is is the reason the quasi wilderness was wrapped around it. I think Three Lynxs or Oak Grove was PGE's laboratory so they could play around with ideas of how to bring more electricity to Portland. That is why Big Bottom was brought into the picture in the first place. Look where PGE began in the first place at the the falls in Oregon City. A rural site 20 miles away bringing electrical power to stump town. Kind of like today, the resources of the state benefiting those who live in the valley, but not so much those in the rest of the state.